When I was 11, I saw Les Miserables on Broadway. I was mesmerized by it. I thought that Les Miz was the most wonderful thing I had ever seen. Over the years, I’ve always enjoyed the musical and have listened to a number of different recordings and seen multiple film adaptations of the book. Until this week, there still hadn’t been a film version of the musical itself. As one of the most popular musicals of all time, Les Miserables has a lot of fans from all over the world who have eagerly awaited this movie. While the reviews have been mixed, I thoroughly enjoyed the screen version of the musical. Many have commented that people who like the musical will like the movie. I think that makes sense. Both versions essentially have the same script. Because the story is so well established within the musical, I felt that the director had his hands tied with how to handle certain elements to the story. I think that is worth taking into consideration. The musical also had some unique features. For instance, the singing was live. In other musicals, there is usually a soundtrack and performers are lip syncing. Not so for Les Miserables. While that’s not the first time that this method has been used, it is uncommon to feature live singing in a musical. Another unique feature to the musical is the fact that there is essentially no dialogue. Unlike other musicals which have songs and dialogue, Les Miserables is entirely sung. 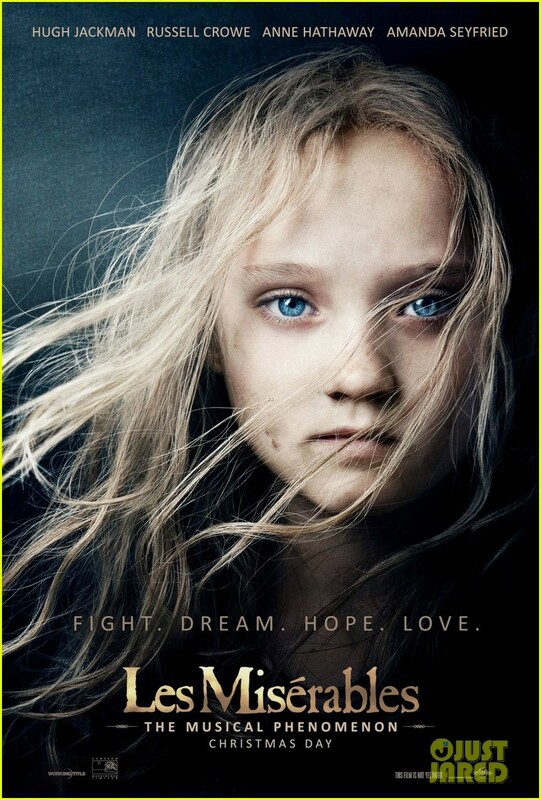 I love Les Miserables because there’s so much richness to the story. It’s something that can appeal to anyone. It’s a story about redemption and sacrifice. When I first saw the musical as a kid, I really identified with Gavroche, the street-smart child who takes part in the revolution. There’s Fantine’s character who is a parent trying to do everything she can to provide for her daughter. There is revolution. There is unrequited love. With the unrequited love, I think that is a major factor in the musical’s appeal. With the love triangle between Marius, Cosette, and Eponine, it’s easy to sympathize for Eponine’s character. She’s in love with Marius (who’s completely oblivious to this), but he enlists her to help him pursue Cosette. This is what makes her character compelling. In one way or another, we’ve all been Eponine. But the driving force behind what makes Les Miserables compelling is undoubtedly Jean Valjean. From a convict who’s looked down on by society, we see him grow and become a man of integrity. I think that it is important to have a sense of the plot going in. With as much singing as there is in this film, a lot of the songs make reference to the overarching themes of Les Miserables and some of these comments might seem cryptic without understanding the story. As far as the characters, I thought that Hugh Jackman was strong vocally and successfully conveyed the grace and strength necessary for the role of Jean Valjean. Anne Hathaway plays Fantine who’s an important character in the first half of the musical before dying. That being the case, there isn’t as much time to develop the role but I thought that Hathaway captured the emotion of Fantine. Eddie Redmayne palyed Marius. Samantha Barks was loveable as Eponine. She’s played the same role in London and also played Eponine in the 25th anniversary concert. Her performance was truly one of the shining lights of the film. Sacha Baron Cohen was the comic relief in the form of Thenardier. For Cohen’s personality and the types of roles he typically plays, I felt that he hsd the right personality for that role. One character who’s performance underwhelmed me was Russell Crow as Javert. I would encourage people to familiarize themselves with the basic plot before seeing the musical. You forgot to mention how awful Amanda Seyfried’s was…Probably the worst singer in the movie; she is deffinately as bad if not worse than Russel Crowe. In general, I don’t think there’s as much to do with her character. Thanks for sharing. What did you think of the movie overall? Very great post. I just stumbled upon your blog and wanted to mention that I have truly loved browsing your weblog posts. Thanks so much for reading. I really appreciate it.